A high-quality, commercial ice dispenser is a staple in your restaurant or food service establishment. CKitchen specializes in providing businesses with cutting-edge commercial ice dispensers that meet their specific demands, whether they’re a small self-service cafeteria or a busy restaurant. These units help ensure that you have fresh ice on-demand for serving, storing, and preserving food and beverages. The Hotel Series features Turbo Dispense, which dispenses 1/4 lbs of ice per second. It also features Power Clean, which allows access to the bin for easy cleaning without having to move the ice dispenser. The Hotel Series features foam insulation, as well, for maximum ice preservation and storage without melting. The units in this series are constructed of corrosion-resistant stainless steel and fingerprint-proof plastic. They are user-friendly with push-to-dispense operation. 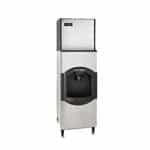 Ice-O-Matic also has a line of Ice only or Ice and Water Dispensers known as the IOD line. They are ideal for Cube or Pearl Ice makers, and they feature Direct Dispense which ensures that ice hits the glass every time. They also have Quick Stop which prevents ice overflow and waste. The IOD line has Power Clean, Auto Rotate which turns the ice for 4 seconds every hour to consistently provide more dispensable ice. Another ICE-O-Matic Ice Dispenser option is the GEMD270 Pearl Ice and Water Dispenser, which features Rapid Recovery Time, producing 11.4 lbs of ice per hour. It has Touch-Free Dispense and a plastic chute that can be easily removed and cleaned. The GEMD270 models features Quiet Operation and a lighted, user-friendly keypad, which are both ideal qualities for any establishment. 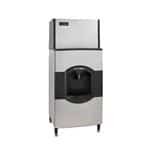 No matter your specific needs, volume, budget, or space requirements, CKitchen.com can help you find the perfect ice dispenser for your environment. Our top priority here at CKitchen is to provide each of our customers with the best possible customer service, as well as high performing, dependable products. We are absolutely certain that you will be more than satisfied with any of the commercial ice dispensers here. Shop our selection of ICE-O-Matic Ice Dispensers for the guaranteed lowest prices and fast shipping.